The C27 Jess Horn was a collaboration with Jess Horn, one of America's premier custom knife makers and was produced for Spyderco by Moki in Seki City in Japan. It holds several distinctions. It is the only Spyderco branded folder which does not use the trademark "Spyderhole" round hole opener. Instead it uses an alternate implementation of Spyderco's original patent which consists of a pair of trapezoidal depressions, one on each side of the blade to allow one hand opening. At the time of its introduction, it was the most expensive single folder Spyderco had produced to that date. It is also the only Spyderco branded folder offered with a serrated edge which does not use Spyderco's trademark "Spyderedge" serrations but, instead, uses small serrations of equal size. The C27 Jess Horn first appeared in the 1994 Spyderco catalog/brochure. It remained in the catalog until 1998. "Unlike most CLIPiTs, the Jess Horn model was not designed with a thumb-hole in the blade. It can, however, be easily opened with one hand by using hte trapezoid indent. The handle is embellished with a "jigged bone" that is specially made for Mr. Horn. The front lock incorporates a spring and spacer between the scales as one polished piece. The entire knife reflects Jess's custom style and signature. This is one of the world's finest custom manufactured knives. From the jigged bone handle to the meticulously sculpted stainless clip, this folder boasts precise fit and finish that is second to none in manufacturing. Efen the lanyard hole features attention to detail - it's chamfered and lined. This collaboration between Jess Horn and Spyderco represents a superb value for collectors considering a Jess Horn custom would equal three to four times the cost." As mentioned earlier, the C27 Jess Horn was built in Japan, by Moki. 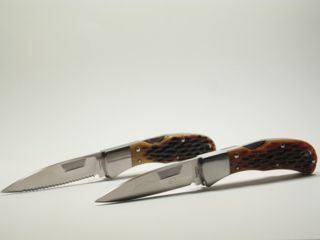 It was available in both plain and serrated edge. While there are no "variants" per se, there are a number of variations in marking. The Collectors club numbered pieces were numbered on the left bolster and at least some of them do not carry Jess Horn's signature engraved on the blade. Higher numbered pieces were numbered on the blade. Some un-numbered pieces also were produced. Finally, there were some "leftovers" from this run sold by Moki under their own label without the Spyderco name on the blade tang. C27 Jigged Bone scales Stainless Steel front bolsters and liners PE ATS-34 1994- 1998 $349.95 (1994) 600 Full Flat machined stainless steel 3 screw TD RH ? C27 Jigged Bone scales Stainless Steel front bolsters and liners SE ATS-34 1994- 1998 $349.95 (1994) 600 Full Flat machined stainless steel 3 screw TD RH ? As with most collectible Spyderco knives, the PE version is most favored by collectors. Are there Collectors Club numbered SE knives? Collectors Club numbered (019) on bolster, no signature on blade. Serrated version, signed and numbered (585) blade. Note serration pattern. Unnumbered plain edge, signed blade. Closed, clip side, note recessed Allen head clip screws. Interior view to show one piece combination backspacer and lock spring. This page was last modified on 29 April 2015, at 06:55.